Please note: This course is not for everyone. It is for the nurse who has heard about complexity leadership and would like to learn more about it. But it is not a fast read. It requires thought. It will require every minute of the 19.5 contact hours allotted to it. As hospitals and health-care organizations strive to meet the standards of the Magnet Hospital Recognition Program and the challenges of the Institute of Medicine’s nursing workforce initiative, today’s leaders must be able to respond in ways that embrace rapid change. 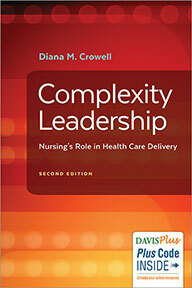 Complexity Leadership: Nursing’s Role in Health-Care Delivery introduces you to complexity science and the complexity model of contemporary leadership. It focuses on how to lead in complex systems and chaos, how complex systems function, and how to navigate them successfully. "I enjoyed the book and was surprised at how it interlinks with my current job."